All these heroes could be joined by a familiar face... if they survive Infinity War, that is. Amazon has found a familiar star for its adaptation of The Boys. Get a look at Elastigirl’s new suit in more Incredibles 2 footage. Kevin Smith returns to Central City in new pictures from The Flash. Plus, a new look at the BBC’s adaptation of The War of the Worlds, and more footage from Archer’s return. To me, my spoilers! In an interview with THR, Marvel Studios executive Victoria Alonso stated she “cried” seeing Michelle Pfieffer on set, possibly revealing Janet Van Dyne has a role in either of the two upcoming Avengers films—presumably the latter, given that Scott and Hope are expected to show up in Avengers 4. 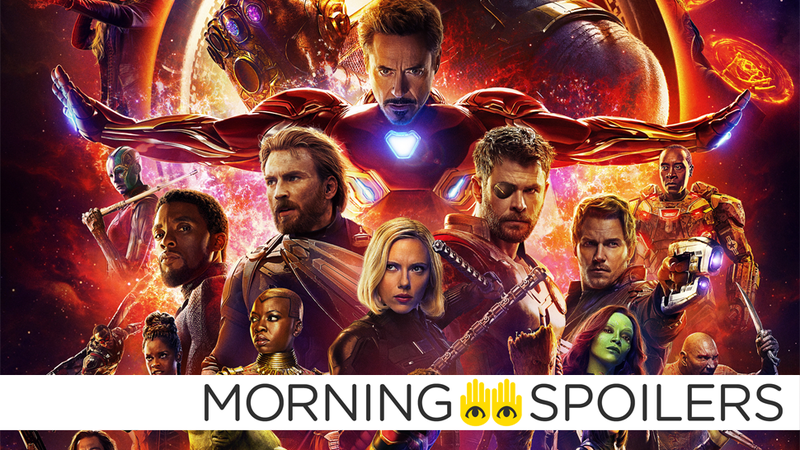 Marvel’s next film is Avengers: Infinity War. With a budget upwards of $300 million, is it the biggest movie you’ve worked on? Infinity War is a dream come true. Everybody has had other journeys, but this is sort of the moment in time where their journeys collide. We didn’t have everyone there all the time. That only happened for two or three days. Were you there when everybody was there? Yes. I’m not going to lie to you, I cried. You say to yourself, “Huh?” You have big stars talking about other big stars as in, “Gasp, is that Michelle Pfeiffer? It is! Oh, was that so-and-so?” It’s like their little Hollywood moment, which I found lovely and endearing. Elsewhere, Ant-Man and The Wasp have made the cover of Disney’s Official Fan Club magazine, D23. D23 has also released a new piece of Infinity War concept art, while Coming Soon has the film’s IMAX poster. A video celebrating the fashion icon that is Edna Mode is mostly old material, but there are a few new spotlights of Elastigirl’s new costume in this version. Eighteen years in the making, here’s the first trailer for Terry Gilliam’s The Man Who Killed Don Quixote. Johnny English fires missiles at the Tour de France in the first full trailer for Johnny English Strikes Again. Variety reports Fox is developing a “supernatural drama with a Latin musical twist” from producer Roselyn Sanchez. The project is set in Miami, where magical beings have lived secretly among humans for decades. Two rival nightclubs will set the stage to explore American society through tales of unrequited love, the perils of greed, and the power of música. The aftermath of the showdown with Black Lightning (Cress Williams) leaves everyone reeling. Meanwhile, Tobias (Marvin Jones III) gathers his forces. Nafessa Williams, China Anne McClain, Christine Adams and Damon Gupton also star. The episode was written by Charles D. Holland and directed by Salim Akil (#113). Original airdate 4/17/2018. Meanwhile, KSiteTV has images from next week’s episode, “The Resurrection and the Light: The Book of Pain.” Click through for more. Spoiler TV has images from next week’s episode, “On the Road.” More at their site. The BBC has released the first image from their latest adaptation of The War of the Worlds, set in Edwardian England and starring Eleanor Tomlinson, Rafe Spall, Robert Carlyle and Rupert Graves. Syfy has released another featurette on how Krypton is bringing Brainiac to life. FXX has one more trailer for Archer’s latest season. Finally, Netflix has released the opening title sequence for their reboot of Lost in Space. Think Star Trek: Enterprise meets Stargate: Atlantis.